This plugin is no longer maintained. While it may currently work, there no guarantees it will in the future. If you're looking for alternatives, try NametagEdit. /ctags, /coloredtags - Some info about the plugin and the author. /ctags reload coloredtags.reload Reloads the plugin. /ctags update coloredtags.update Permission to execute the command and receive an update notofication on join. This plugin will probably conflict with any other plugin using scoreboard (most notably sidebars and colored tag names). It should work with HealthBar. This plugin uses Metrics-Lite, to track anonymous data about servers using this plugin. It will help the future developement, and has no impact on your server's performance. If you really want to disable it, go to the folder /plugins/PluginMetrics and set opt-out: true. hai i hav a servr and i dunt know how to make ranks so this can help me maybeh? The plugin is not working! Dont working. I have spigot 1.8.8 and permissionsex. Is there any way to increase the amount of characters you can have in your prefix/suffix? Because of all the color codes I'm doing, it's cutting half of it out. I've looked through the config, I found nothing. Add a function so that the text can be filled with different colors. I love this plugin, its the best tag addon i've seen! But there is one slite issue, I have 2 staff ranks that dont work with it: Jr.Mod & Sr.Mod. I might know the problem, the ". (dot)'s" might be the problem, so what I did was removed the ". (dot)" and made it SrMod. But it made a huge error & I changed it back, but while it was SrMod the tag worked. So I did figure out it was the ". (dot)" If there is a fix for this, please do tell & give an explanation on how to fix it. Thanks if you know how and you do help! 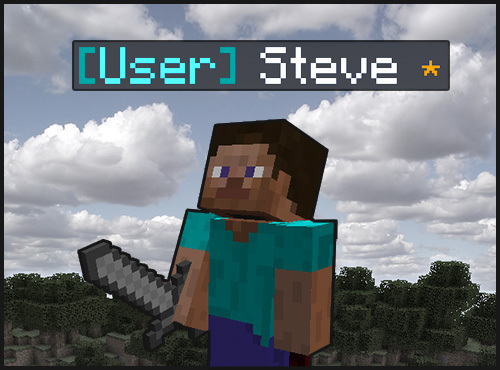 Is there a way to display the colored tags and nicknames in Minecraft Chat? For instance, when someone with the tag  sends a message, it appears in the chat sth like "Player:message"
when i instaled the plugin it keeps saying om the 10 sec a error how do i fix it? what version server are you running? and do you have permissions plugin?